The 2001 romantic comedy Kate & Leopold starred Meg Ryan and Hugh Jackman in a time-travel love story that I thought was a lot of fun, even if it wasn’t very believable. Kate’s cozy New York City apartment was a set built on a soundstage. They built exteriors of other buildings outside the windows so it would look “real” when they were outside on the fire escape. Breckin Meyer played her brother Charlie. Liev Schrieber was Stuart, Kate’s ex and Leopold’s great-great grandson who went back in time and found him. I love these bookshelves in Kate’s apartment–and those tall windows! They cast Australian Hugh Jackman because they wanted “someone fresh” for the role. In 2001, he was a fairly new face to American audiences, although he had appeared in X-Men as Wolverine the year before. Jackman was nominated for a Golden Globe for this movie. Leopold takes Charlie’s advice and waits to turn the dishwasher on until Kate is there to see him do it. Smart man! In the Director’s Cut, Stuart turns out to be Leopold’s great-great grandson. However, the studio had concerns about the fact that this made Meg Ryan both Stuart’s ex-girlfriend and his great-great grandmother. The ick-factor led them to edit out all mentions of Stuart’s family connection to Leopold. Sting was nominated for an Oscar for the song “Until” that plays over the credits, and he won a Golden Globe for it. Kate & Leopold was written by James Mangold, who went on to write and direct Walk the Line in 2005. I thought it was a fun little movie if you didn’t think about the time-travel details too much! Meryl Streep's House & Bakery in "It's Complicated"
.-= Janell Beals´s last blog ..You Can Have It AllBut Rarely At The Same Time =-. Sting has an album of his movie hits (I don’t remember “until” on it) it’s my fav CD, was playing it in my car just today! .-= Annie@ A view on design´s last blog ..Elegent Elsternwick =-. I love that Meg Ryan almost always has great apartments with shelves full of books in her movies. .-= Mary Beth (Cats, Books, Life is Good)´s last blog ..THE MOUSE CHRONICLES =-. .-= Susan´s last blog ..Camp Susu-part 1 =-. .-= Issy´s last blog ..Havent felt =-. I saw that movie…don’t remember it;) The kitchen cabinets are cute. Went to her current home…loved that. .-= Becky @ Farmgirl Paints´s last blog ..Natalie =-. Totally agree about Meg’s hair……seems she has a love affair with a straightener! I always like it when floating bookshelves look good, because they always look messy and out of place in my house! .-= Heather Collins´s last blog ..Evolving destination =-. .-= ana @ i made it so´s last blog ..weekend in a nutshell 6 =-. It was a cute, silly, chick flick, that I saw with my daughter, so named Kate, and a fun little escapade in time and space – and Kate’s apartment! Thank you for posting it. I’ve watched it again, several times, just to look at the furnishings and, well, yes, of course, there is Hugh Jackman and that wonderful roof top scene where they dine and they dance and it’s all make-believe. .-= Penny´s last blog ..Rising to the occasion =-. Thanks for featuring this movie. I had forgotten about it. I recently saw The Time Traveler’s Wife, and I didn’t like it because the time traveling didn’t really mean anything. At least in this movie, something actually resolves with the time traveling. I could do a whole Meg-in-NYC film festival w/ her apartments in When Harry Met Sally, You’ve Got Mail, and this one! And I agree with you about her hairstyle. How hard does a person have to work to create something that doesn’t flatter Meg Ryan??? .-= Kelly@40isthenew30´s last blog ..Good News! =-. I love this movie, and own it. I loved the apartment, the ‘old’ NYC, the houses in ‘old’ NYC – and I was obsessed with the earrings she wore – but could only find them at Tiffanys.com for over $5,000.00. Oh well. Thanks for the article, enjoyed it so much! .-= Suzy´s last blog ..No Good News =-. This is another movie I like, but have trouble watching. The husband groans and complains the whole way through. In whatever movie Meg Ryan is in, I always love her apartment or house. .-= rhianna´s last blog ..Mag Moday – Oh to be a fly =-. I thought Kate’s apartment was cool with all the windows but not impressed with the mismatched furniture. I also didn’t realize that this movie appeared at the Globes! .-= Hailey Erickson´s last blog ..Welcome to Muffin Else Matters! =-. 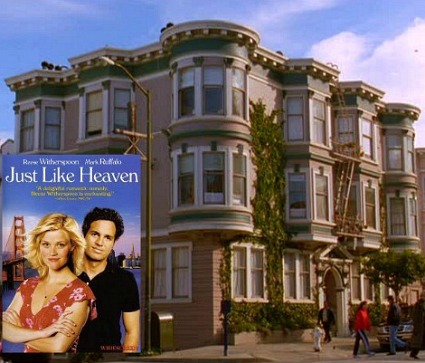 Seems Meg Ryan’s characters always have the best houses! .-= Lori-Anne´s last blog ..The Gift of Lavender =-. This was a cute movie, but you’re right–not at all believable. Hugh Jackman was the redeeming factor for me—he was so dreamy!!! Meg Ryan’s face is just distracting. Wish she would have aged gracefully, b/c she just looks pinched. .-= Amanda @ Serenity Now´s last blog ..Never Heard That One Before A Blogging Tip =-. Awwww I love that movie, such a sweet story! Kate’s apartment was one of my favorite parts, and the fact that they used the fire escape to go between her and Stuart’s place. Ever since seeing that movie my husband and I chuckle when we ride elevators and escalators, they all say “otis” which if you remember that part is supposedly because Leopold invents the elevator and names it after his beloved butler Otis. .-= hip hip gin gin´s last blog ..Getting There- Round the Bend =-. I loved this movie! I am such a sucker for a chic flick though…it was romantic and scenery was wonderful. .-= black eyed susans kitchen´s last blog ..WHEN COLLECTIONS FIND YOU =-. Meg Ryan always has great housing in her movies. I wonder how she does that? You should do her house in The Land of Women. .-= Mom in High Heels´s last blog ..Indy is 8! Legoland is awesome! =-. .-= Jessica´s last blog ..All Creatures Great &amp Small =-. Please accept my belated sympathy on the loss of your beloved Grandmother Hazel. I can actually say that I know how you feel because I, too, had a wonderful Grandma Helen. It’s been 10 years and I really still miss her loving presence. I hope you have many of her recipes or sentimental belongings so that you can relive the warm memories that you two shared. Some old lady out here in California upon seeing Meg at a grocery store with that unkempt style of hair told Meg to run a brush through that hair! That’s funny….I liked her hair in that movie. I think I was so sick of her You’ve Got Mail hairstyle on everyone that I was glad to see a change. I do love that movie though. .-= Rachel´s last blog ..Faces Need =-. I enjoyed the movie; I guess I just like anything that Meg Ryan plays in. Yes her hair wasn’t the greatest do I’ve seen her wear, but I think there is something so cute about her. It’s funny last Friday I told my hairdresser I wanted my hair cut like Meg Ryan used to wear it, thankfully she didn’t think I was talking about this one. And you’re right loved the bookshelves and the long windows. The apartment has an organized cluttered look to it. Such a cute place. Super hot kitchen! .-= Juju at Tales of Whimsy.com´s last blog ..Friday 56- The Choir Boats =-. I agree with your comment about Meg Ryan’s hair. In every picture that she’s in, I can’t see her apartment, because I’m distracted by her unflattering hair. I hope no one was paid union pay to come up with that hair-do everyday. .-= Nancy Hood´s last blog ..What Kind of Nut Are You! =-. It was Timerider: The Adventure of Lynn Swann (1982). haha Not knowing the title drove me crazy. Thank you, Google!! I never thought to see this movie, even though I really like Meg Ryan. So thanks for the recommendation. I love the red kitchen! .-= Lesley @ TheDesignFile´s last blog ..Design Star- A room so bad two are eliminated =-. I never liked this movie because I couldn’t get past Meg’s messy hair and apartment. I can see the apartment was not as messy I thought when watching the film. I did, however adore, Leopold, a true gentleman. Also, I loved the final scent back in time. I may also have disliked the film because Meg’s looks had really changed (lips, thinner, messy hair, etc.). Plus the film came on the heels of You’ve Got Mail which was a triumph in both the adorable apartment, cute Meg with neat hair, and Tom Hanks. I saw this film once, but it wasn’t one of my favorite Meg Ryan movies. Great looking apartment though. I would love to live in a place like that. Love this! That mirror is beautiful and the kitchen is too cute! .-= Jess @ Frugal with a Flourish´s last blog ..Dimming Down a Too Bright Paint Job =-. I don’t get the lip comments tho. This movie was made at least two years(!) before any of the rumors about the botched plastic surgery started. May I make a request for a future movie house? Meg Ryan in When a Man Loves a Woman. LOVED that house!!! I’m a huge Meg Ryan fan but haven’t seen this one yet. All the white woodwork and gorgeous molding is making me think I know what’s going to be added to my Netflix account. Thanks, Julia! .-= Sheila´s last blog ..Pronunciation 101- Caprese salad =-. .-= Justine´s last blog ..More art that makes me happy =-. I waited forever for this post, hoping you’d catch a shot of my favorite detail in the whole apartment, the orange silk lantern over the bath. Has anyone else fallen in love with that detail? I’m also wondering if anyone can id the wallpaper. I loved meg ryan’s leather jacket in this movie. Any ideas where I could get one like it? I love this movie too. In fact I’m watching it right now on DVR! I’ve been wondering, what is that device that Kate points up at Stuart’s floor and “shoots” his dog and him with. The effect is like some electrical sting. I’ve always wondered about that and what could inflict pain on someone going through a whole floor. Was that made up too? I think she zapped him with some sort of electric anti-bark device. She knew his morning schedule and just kept zapping until he was holding the collar.